One of the struggles that the creators of The Handmaid’s Tale were sure to run into before long was how to turn the compact source material of Margaret Atwood’s novel into something as big and stretched out as a TV series. It’s a challenge that’s only going to grow now that the show has been picked up for a second season. So far, the writers and producers have padded things out nicely, adding the right amount of additional flair and back story to flesh out Atwood’s minimalist prose. Their biggest potential gamble came with this week’s installment, taking a diversion to track the fate of Luke (O.T. 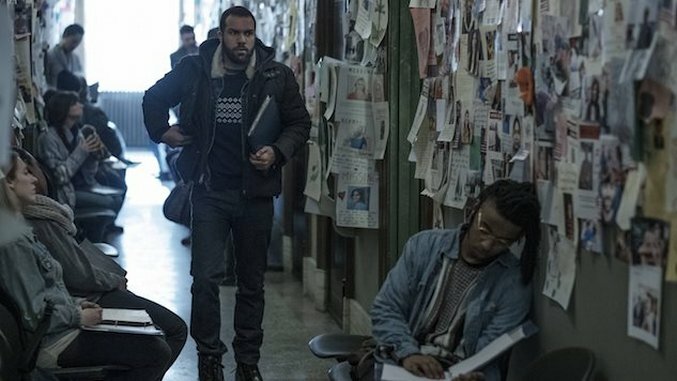 Fagbenle). I could see a lot of other series slapping this storyline in early to present some glimmer of hope for viewers and counteract the otherwise bleak, forbidding nature of Offred’s current situation. By slotting it in towards the back third of this first season, The Handmaid’s Tale not only logically follows the storyline of our protagonist as she finds out that her husband is still alive and can get a message to him; it also allows us to sink more deeply into the world of Gilead before taking us out of it entirely for one hour. Not that what we’re given in return is any brighter or more hopeful. Even as we see the moments of blissful domesticity that Luke, June (Elisabeth Moss) and Hannah enjoy in a secluded cabin as they try to make their escape, we know that eventually they’re going to get caught. It’s just a matter of shading in the details of how they were able to get as far as they did, which in this case was the help of a family friend who stuffs the trio in their trunk and drives them out of the city. As the episode skips back and forth between two points in the past, it’s clear how slim Luke and June’s survival really was. The family was rousted from their hiding place after a neighbor stumbled across them, and later Luke narrowly avoids getting killed when Guardians start shooting up the boat he’s escaping on. It’s only the epilogue that offers some sliver of hope, as Luke, visiting the American embassy in his new home of Toronto, is given the note June slipped to one of the Mexican officials. While a little thin narratively, the episode makes up for it through small stunning visual moments. Director Floria Sigismondi (The Runaways) leaves some indelible marks on the series with this hour, including keeping us inside the ambulance as it tumbles down a small cliff, with equipment and bodies suspending in mid-air, or the harrowing shot of a dozen or more bodies hanging from the ceiling of a church. But it’s the scene at the end that stands out, with the camera focused tightly on Luke’s face as he shakes with emotion after reading June’s note. We can’t avoid every flicker of joy, anger and fear that dashes across his face, nor every teardrop that streams down his cheeks. He’s shaken to his core, and through Sigismondi’s lens, we are too.